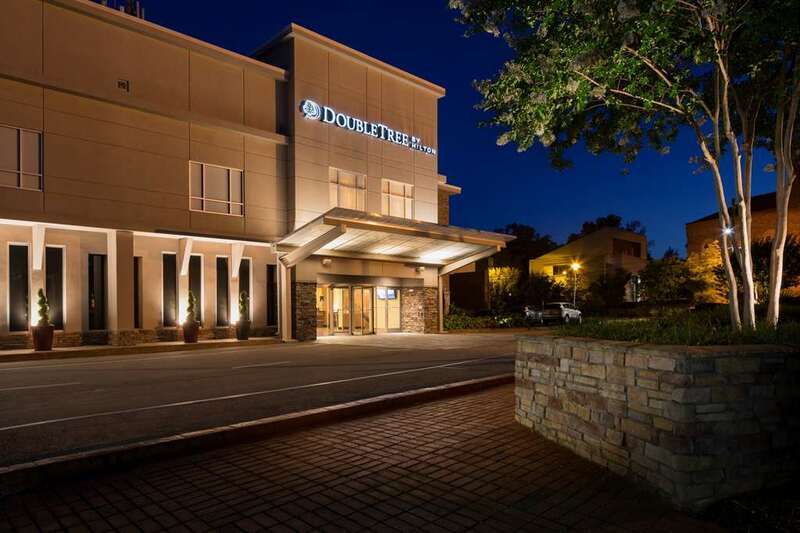 100 PCT NON SMOKING The DoubleTree Raleigh Brownstone is an upscale full-service hotel within walking distance of North Carolina State University. Conveniently located near US 1 and I-40 the hotel is just 20 minutes from Raleigh-Durham International Airport RDU and Research Triangle Park. Guests enjoy a suburban location within a mile of downtown in the heart of the Cameron Village shopping area. The hotel is also less than a mile from the new Raleigh Convention Center and North Carolina*s State Capitol. Spacious guest rooms and suites feature generous work surfaces complimentary internet access luxurious Sweet Dreams bedding and flat-screen HDTVs. Hotel amenities include complimentary onsite parking complimentary wireless internet access a 24-hour fitness center a 24-hour business center and complimentary access to the state-of-the-art YMCA next door. Start the day right with our extensive DoubleTree breakfast buffet in the Harvest Grille and end it over dinner and a glass of wine or cocktails at the Harvest Bistro. For meetings the DoubleTree offers 15 000 sq. ft. of flexible meeting and conference space including a large ballroom. A great hotel location near RTP state-of-the-art A/V and connectivity solutions and a well-equipped business center help to ensure a successful event for your Raleigh area business meeting or seminar. Our hotel is also convenient to virtually all Raleigh-Durham area attractions as well as the universities and research facilities for which the area is known. We*re close to the NC Fairgrounds and major museums Pullen Park Glenwood South Night Life District the RBC Center Carter-Finley Stadium Time Warner Music Pavilion and much more. When you travel to North Carolina our helpful hotel staff looks forward to welcoming you to Raleigh with our signature warm DoubleTree chocolate chip cookie at check-in. Harvest Grill Restaurant-Bar: Harvest Grill features an excellent blend of traditional American cuisine focusing on fresh local ingredients.